With the Federal Reserve's rate-hike plans on hold for the foreseeable future, US fixed-income markets continue to rally. Yesterday's release of minutes for the Federal Reserve's last meeting suggests that bonds will continue to enjoy a bullish tailwind for the near term from a monetary policy perspective. For the December meeting, the probability rises above 50% (slightly) for the first time in projecting that the central bank will reduce its target rate. With the Federal Reserve's rate-hike plans on hold for the foreseeable future, US fixed-income markets continue to rally. Leading the across-the-board gains for bonds this year by wide margins: high-yield securities and long-term corporates, based on a set of exchange-traded funds through yesterday's close (Apr. 10). SPDR Bloomberg Barclays High Yield Bond (NYSEARCA:JNK) is the bond market's top year-to-date performer with a strong 9.0% total return. Using recent history as a guide, the ETF's bull run this year remains red hot: the fund rose nearly 0.4% yesterday, closing at a record high (after adjusting prices for historical distributions). Yesterday's release of minutes for the Federal Reserve's last meeting suggests that bonds will continue to enjoy a bullish tailwind for the near term from a monetary policy perspective. The minutes revealed that "a majority of participants expected that the evolution of the economic outlook and risks to the outlook would likely warrant leaving the target range unchanged for the remainder of the year." The second-strongest gain this year for US bonds is currently held by long-term corporates. Vanguard Long-Term Corporate Bond (NASDAQ:VCLT) is up 8.4% year to date. 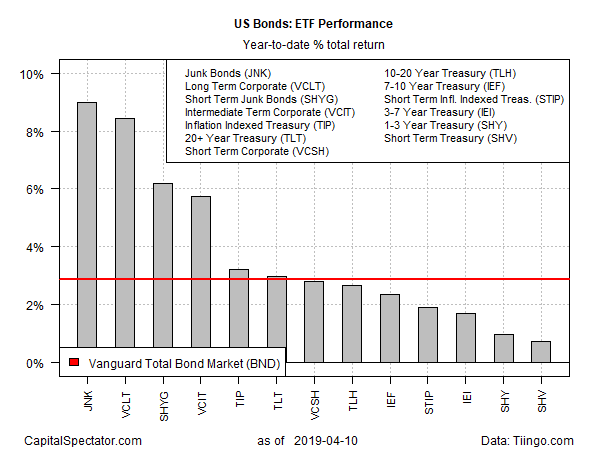 The US bond market overall is also enjoying a rally so far in 2019, based on a broad measure of investment-grade securities. Vanguard Total Bond Market (NASDAQ:BND) closed on Wednesday with a 2.9% year-to-date total return. At the moment, however, the market continues to expect that the Fed will leave interest rates unchanged for the foreseeable future. Fed funds futures (based on CME data) are pricing in a 98% probability that at the May 1 FOMC meeting the central bank will again leave its target rate unchanged at the current 2.25%-2.50% range. The current nowcast for first-quarter GDP, scheduled for release later this month, also aligns with expecting the Fed to stay dovish. This year's Q1 GDP growth remains on track to post another round of deceleration, slipping to a sluggish 1.8% increase, based on the median for a set of estimates compiled by The Capital Spectator. Looking further out, no change for rates remains the path of least resistance, per Fed funds futures, although the odds gradually rise for a cut as the year unfolds. For the December meeting, the probability rises above 50% (slightly) for the first time in projecting that the central bank will reduce its target rate. Meantime, market sentiment continues to provide a tailwind for bond-market bulls.